The idea of a smart home is cool, of course. But which smart devices for your home are a really good investment of your money? This problem is made worthy by the fact that there are nearly 180k different devices for home automation systems and fewer ways that these devices can connect with each other. This blog is not a guide about the best devices nor how to turn your home into a smart home. You can find something similar here, or here. Our aim is to provide you with a short review about a technology that smart devices in your smart home can support 100%. It’s about Bluetooth Low Energy (BLE). Widespread Use. It is already an existing protocol in our smartphones and other similarly popular devices. Low Energy Consumption. BLE doesn’t use a lot of energy which is highly important for devices which use batteries. Mesh Network Format Support. Starting in June 2017 BLE protocol officially supports mesh networks. 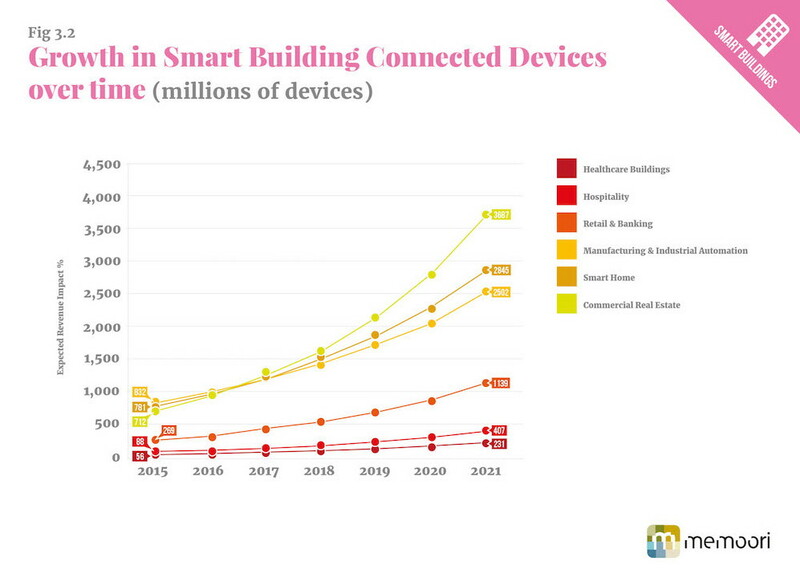 But first a short overview about the smart home business segment over all. The Smart-home market share did $23.4 billion in business during 2015 and is expected to grow to $32.5 billions in 2017 and up to $58.68 billions by 2020. The home automation branch divides to sub segments and these most in demand are Commercial Real Estate market, Smart Home, Retail and Banking. It is expected that over 3.6 billion devices will be installed by 2021. People are now able to control the IoT devices using voice, smartphone or tablet. Or they can even just leave the controlling to self-learning devices themselves. People can simplify daily tasks by setting up alerts about their home to be sent to their smartphone. Data from sensors for temperature, lights, doors, windows, motion detection can be shared with applications and sent to the cloud. Lights, temperature, household appliances, window and door locks, security systems, refrigerators, smart ovens, and even robot vacuum cleaners can be activated in response to this data. The possibilities are endless. Imagine that the cat has knocked a glass on the floor, your phone alerts you and the glass is vacuumed up before you arrive home. 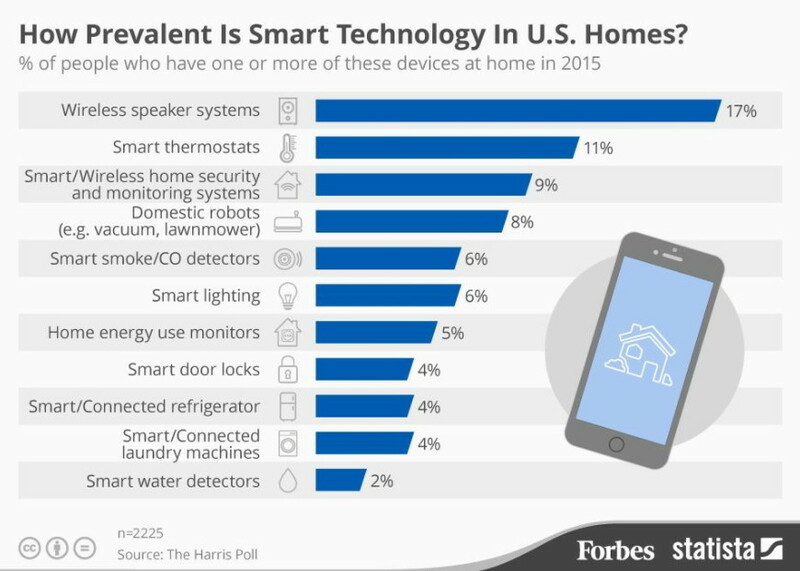 How prevalent is Smart technology in U.S. Homes? BLE solutions are most appropriate for home lighting, heating and ventilation systems, and wearable. For home security systems with door and surveillance cameras and for entertainment devices Bluetooth and WiFi can be used, and only WiFi when we have high throughput requirements (streaming a real-time video or file transferring). Table. 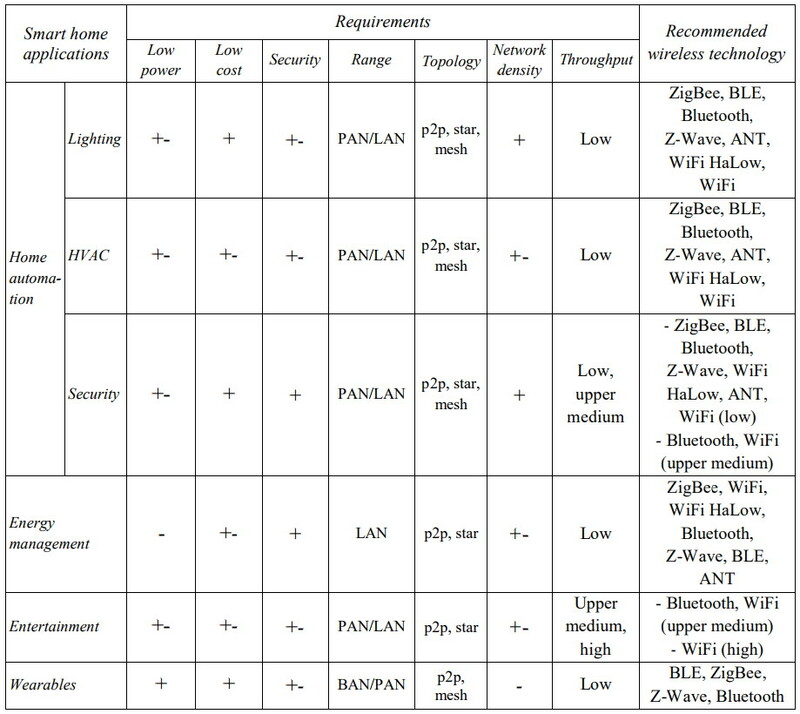 Recommended wireless technologies depending on appliance. Control electricity consumption in a home using Bluetooth powered smart meters. The Bluetooth low energy technology ensures that digital electricity meters run accurately and efficiently. You can use these Bluetooth powered electricity meters with a variety of home appliances, including electric heating devices, electric cookers, and AC systems, to control power consumption. For example, a Bluetooth meter allows you to turn off any device without being physically present, thereby reducing power waste. A few smart thermostats are using BLE for remote control via smartphone. In most cases, smart heating devices use a WiFi connection. This can be a problem; not with the thermostats but with bluetooth connections. It still could be handled improperly and depends on different producers. Using different bluetooth thermostats is unlikely fix the issues with connection. Although it happens sometime only if you are lucky. BLE is often applied for small thermostats that integrated heaters which can be controlled via a smart phone. 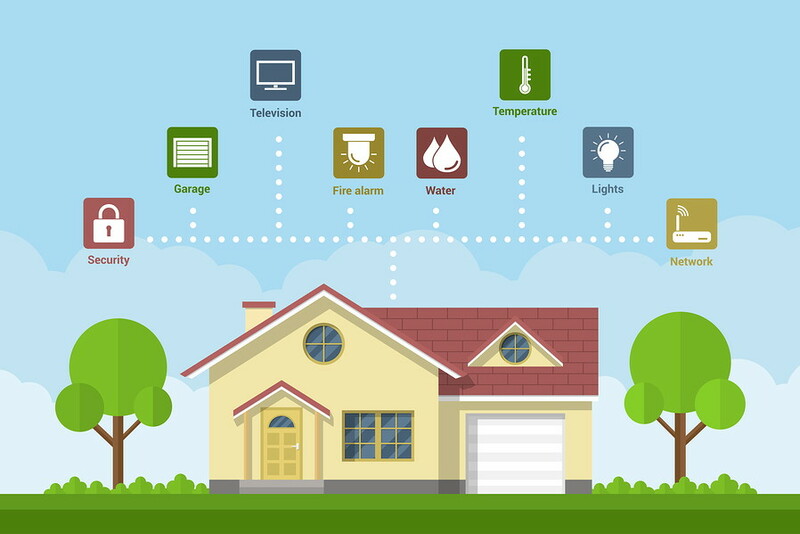 Smoke, water, fire sensors are among the basic components of each smart home. Motion sensors could doubtlessly also be used. These small devices are very helpful and could function for a very long time because are powered by battery. Motion sensors could be placed wherever and activated at night or when you go away from home. The device informs you about any motion by sending a notification to your smartphone. Motion sensors often are used in conjunction with other elements of a smart home. For example, they could measure temperature or even light intensity. Then, a device could dynamically adjust the lamps according to the amount of natural light. Also, motion detectors could be equipped with an accelerometer. The sensor’s movement monitoring feature may be used for example to wait until a baby is asleep and then turn a light off. Mostly it is about smart locks. A smart lock is a good thing. Smartphone apps can unlock a door simply. Smart locks allow you to create digital keys that could be shared with family and friends. It provides you with control over when particular people have access. It can send you alerts when a door is locked or unlocked. That is the bright side of things. But the truth is Bluetooth locks are still unsafe. Many Bluetooth Low Energy smart locks can easily be hacked and opened by unauthorized users, and their manufacturers seem to not want to do anything about it. As much as 75% of smart locks may be opened using wireless attack. The problems don’t lie with the Bluetooth Low Energy protocol, but rather in the way the locks implemented Bluetooth communications. Or the problem can lie with a lock’s companion smartphone app. For example, some apps simply transmit their user passwords in plain text to smartphones. It is no problem intercept this data using only a $100 Bluetooth sniffer. There are many tasks that want to be automated. Turning lights on and off, starting/stopping music playing, opening or closing the garage door, starting the car, running robotic vacuum cleaners are just a few among many more. Smart lighting is one of the most applicable and widely used tasks. Today not too many producers have implemented BLE that support smart lamps. Currently many of the smart bulbs need to connect to your smartphone through a home automation hub, however there are other bulbs available that can connect directly to a phone. A smart home can also operate Bluetooth medical devices and equipment, like heart monitors, body sensors, glucose monitor and other wireless medical devices. Or track workouts in the home gym with Bluetooth powered heart rate monitors. Each day the system updates the medical data when a person is at home. And at the last we should talk about one more thing without which BLE will die in IoT. It’s all about mesh network support. At Jun, 28 Bluetooth SIG introduced new specifications supporting mesh networking. This is what the smart home and IoT segments have been waiting for. The spec allows the support of up to 32,000 nodes (but in practice confirmed well working about 1,000 nodes). Mesh networking is compatible with the core specification version 4.0 and higher. Chips should support the GAP Broadcaster and Observer roles, to both advertise and scan for advertising packets. BLE mesh is secure (AES-CCM and 128-bit keys applied) and promises to spend the same low energy as BLE processors spent before. Bluetooth technology implements a managed flood approach in which only main-powered nodes serve as message relays. Low-power nodes, such as battery-powered sensors, are not responsible for message relay. In a Bluetooth mesh network, low-power nodes with a coin-cell battery can operate for many years. Smartphone or tablet applications will support Bluetooth mesh networking using mesh proxy protocol to enable communication with the mesh network via a proxy node. Software libraries, which provide APIs for the Bluetooth mesh proxy protocol, will soon be available from third parties. Images are used in the article: blog.asurion.com, memoori.com.